Building with all new materials goes fast if you know what you're doing. It looks like it's going to take Bradley only about nine hours to build the entire porch with no help. I estimate that Mark and I, working together, would have taken twice that long (which means four times the man-hours). With scavenged materials, we'd probably multiply our time by two again, but we would have saved a lot of cash --- we spent $660 on materials for this project. 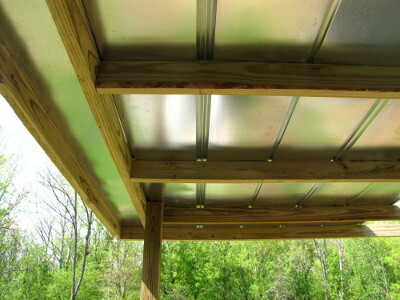 To save on supplies with a metal roof, make your rafters run cross-wise. The first two photos in this post show how Bradley made the roof rafters run the opposite direction from what you'd expect, which saved quite a bit of wood and was still plenty sturdy enough for him to walk on. Use scabs and brackets to turn a two person job into a one person job. Mark kept asking Bradley if he needed help with daunting tasks like setting the four by four posts upright, but Bradley had it covered. 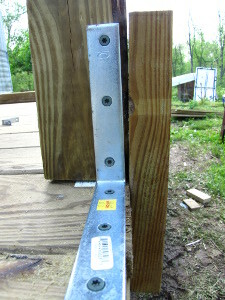 He used wooden scabs and brackets to hold the posts erect until he'd built a box on top to provide structural integrity. 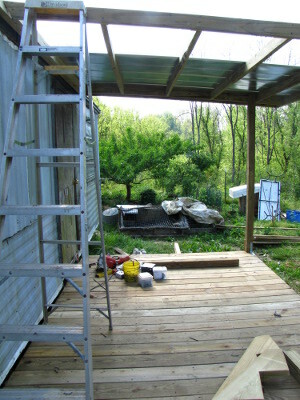 We'll share more shots of the porch when it's done! Our chicken waterer is perfect for chicks from day 1. What direction does the porch face? South? Southeast? 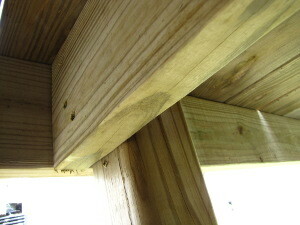 Terry --- This is our summer porch, so it faces north for the most shade.